Ok, so in reality this is the only diaper bag I’ve ever tried but I think it’s the best out there. Here’s why. STYLE: First of all, have you seen some of the diaper bags on the market? I’m not a paisley or flowery type of girl and when I first saw the options out there I was horrified. The Skip Hop is simple yet stylish and the black is right up this NYC girl’s alley. PRICE: The $70 price tag ( good purchase to use that 20% off coupon at Babies R Us) is affordable considering the only other bags I would even entertain buying were super expensive. I love the Rosie Pope’s bags as well, but if you can’t find them on Gilt or discounted somewhere else, I am not sure they’re worth three times the price (or more). Function: The skip hop was designed smartly. 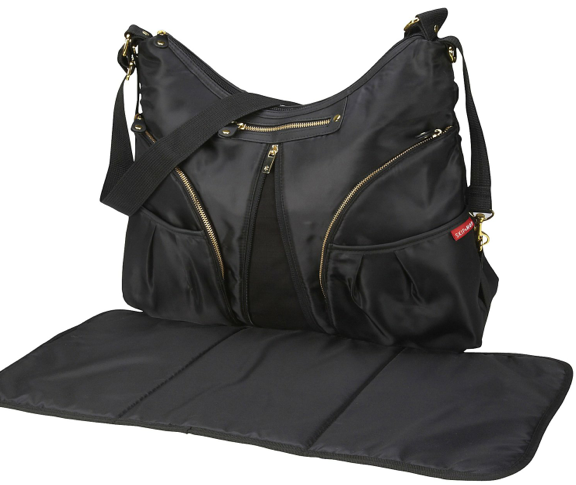 With all the standard diaper bag benefits (waterproofing inside, lots of pouches and pockets to organize, etc), it exceeds expectation by also being expandable and lightweight (key). It also has a great adjustable strap so you can throw it over your shoulder or wear it messenger bag style or, most importantly, it can be adjusted and draped over your stroller. This is KEY since it’s inevitable that at some point it will be overflowing with stuff and you’ll be happy not to have to carry it. Mine practically lives on the stroller handle. Durability: I’m almost two years in with this being my every day bag and it’s still looking great. It has stood up spilled bottles, being overpacked, getting dragged around the house by Aria and the hard streets of NYC. It’s a keeper for sure.